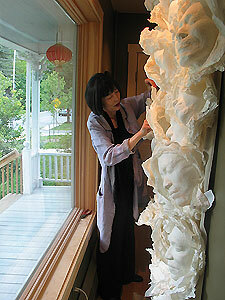 Myong Hee Kim adjusts a section of the Peace Masks tableau now mounted in the front window of the C.X. Silver Gallery. During the past month, an art project that began in Japan six years ago was reborn at World Learning's S.I.T. Graduate Institute. With its innate power to create insight and solidarity, the Peace Masks Project brings people of different backgrounds and cultures together, literally and figuratively face to face. Brattleboro has become a mini-United Nations through this "local" Peace Masks Project. More than fifty people offered their faces for greater peace and understanding among us all, and fourteen of them shared their experiences in a culminating forum at the Brattleboro Museum & Art Center. Participants in the forum were from Azerbaijan, Côte d'Ivoire, Cuba, India, Kenya, Malaysia, Nepal, Romania, Rwanda, Sri Lanka, the Sudan, and the United States. One was a Tibetan living in India. Their faces and those of their colleagues are part of a beautiful tableau that was shown at the Museum and now continues through the summer in West Brattleboro. Museum director Danny Lichtenfeld was delighted to host the forum and exhibit. 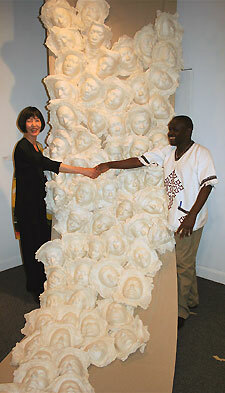 He feels that "Myong Hee Kim's Peace Masks Project is inspirational. So much art attempts to promote peace, but this project somehow goes further, actually managing to instill it not only in those individuals whose faces are represented by the masks but also in those who view the stunning final installation, listen to the participants recount their experience of being 'masked,' and read the peace messages created by those participants." Myong Hee Kim, a Korean-born artist living in Japan for the past 30 years and creator of the Peace Masks Project, explains the art-making process: "There are several layers of mulberry paper applied one by one to the face to make the mold and then the mask. There are about fifty faces in this display. Each face takes about an hour. This is why I call this Slow Art." The face-donor is lying down, has straws inserted in the nose for breathing, and has one layer after another of wet handmade paper applied to the skin, each layer making the whole progressively heavier. 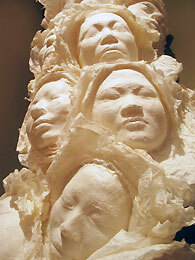 The layers cling together into a mold of the face. The layers harden and then are carefully peeled off as a mask. Through the mask-making process, the gentle, reassuring presence of Myong Hee shines through. Over and over, participants referred to her quiet voice and light touch as sensations that helped them build trust and feel positive and determined to get through an unfamiliar and sometimes uncomfortable experience. For Padmini Solomon of Malaysia, "It made me more than a little nervous to have my whole face and nose covered in plaster. In the sudden darkness I found myself contemplating life and death, and I realized that I was more fully present to everything that was happening to me as I had never been before. Yes, it was a powerful experience to have the mold made of my face. Making the mask from that mold was also intriguing -- you don't quite know what you will look like until you actually see your mask!" Peter Mbae Njogu of Kenya spoke of some of the most important things we can do for each other: giving a gift of ourselves and receiving a gift from others. Here he was giving the gift of his face to participate in the Peace Masks. Participant Caridad Martinez-Echevarria lives in Massachusetts, was born in New York of Cuban heritage, and lived for several years in Puerto Rico. "For me this experience was mostly about trust. It's a process ... a lesson in the steps towards building trust. The anxiety was lessened step by step every time a new layer was put on me. By the time all the plaster was on my face and it became very heavy and very dark, I felt confident enough just to stay with it, to trust through that moment of anxiety [because of] the care that Myong Hee showed me throughout the process. What this whole process means to me in terms of peace building is that through patience and care towards another human being, trust is built and the possibility of peace can become a reality. Peace can mean many things, but in this case, to me peace meant that I could trust that another human being whom I had just met recently had the respect and the patience to care for me. Peace is the building of trust. Myong Hee was able to tune into my needs as we went along." Many insights came from when the wet paper was so thick on their faces that all was dark and they could not talk. Feeling the reassuring hand of a colleague against their own hands helped build trust. They had no idea whose hand it was -- what country or race, even whether it was a man or a woman. One woman participant mentioned that her face mask was thought at first to be the face of a male colleague and vice versa. Myong Hee grew up in an atmosphere of mutual dislike between Japanese and Korean people based on the longstanding history of Japanese occupation of Korea. Thinking at first she would never like being in Japan, she surprised herself by making many close Japanese friends. She came to realize the great importance of people-to-people relationships. "Through my art, I want to honor this relationship for more peace in the world." Turning to gaze at the Peace Mask tableau, she said, "Look at all these beautiful and peaceful faces. We are one human race. And yet we are of such variety." When she heard that Japan and Korea had co-sponsored the 2002 FIFA Soccer/Football Cup, Myong Hee was moved to use her art as a bridge between the Korean and Japanese cultures. This was the first instance of Peace Masks. Since then, Peace Masks have appeared in scores of installations -- at museums and a variety of international events. In the first project of 2002, Myong Hee and groups of dedicated volunteers helped to produce more than 1,500 faces into giant tableaux. The current Peace Masks 2008 project began in CONTACT, or Conflict Transformation Across Cultures, a Summer Peacebuilding Program held each June at World Learning's School for International Training Graduate Institute in Brattleboro. Program director Paula Green explained further: "This year there are 62 participants from 24 countries in attendance, coming from civil society organizations, government and UN offices, human rights, educational, and religious institutions, and graduate students. Faculty are also international, coming from Japan, Australia, Rwanda, and the Philippines, as well as the U.S."
The "meaning" or "vision" behind the Peace Masks Project consists of the following five aspects: (1) resolving conflict through community art workshops and exhibitions; (2) creating bridges between cultures and across generations; (3) respecting the individual while understanding the shared community of humankind; (4) involving others (especially the young) in making art for peace and mutual understanding; and (5) sharing with others. In the final tableau of masks, each mask combines with its neighbors to form an organic, flowing surface of beauty. Light and shadow play with each other. In the sea of faces, facial forms link to each other in their similarity and ripple with subtle variety. Peace Masks 2008 continues in West Brattleboro until September in two new installations at the C.X. Silver Gallery, open daily 9 am to 9 pm by appointment and chance walk-in. Myong Hee may be available in the future for Peace Masks commissions. For further information contact Gallery co-director Adam Silver at cxsilvergallery@verizon.net or (802) 257-7898, ext. 2. Adam Silver is co-director of the C.X. Silver Gallery, executive director of the Asian Cultural Center of Vermont, and also serves as a trustee of the Arts Council of Windham County.